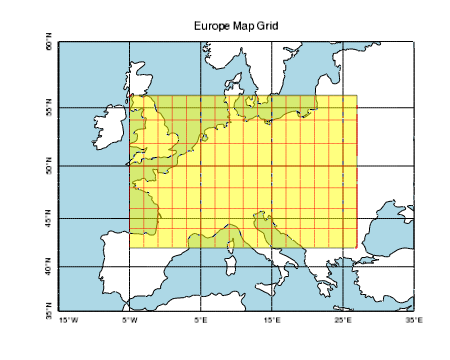 The MAPGRID function plots a map graticule (or grid) onto an existing IDL map graphic. ; Create a map projection with a grid. ; Change the lat/lons separately. ; Bump the alignment of a single longitude. ; Create another map grid. ; Change some grid properties. See Map examples for additional examples using the MAPGRID function. The MAPGRID function returns a reference to the created graphic. Use the returned reference to manipulate the graphic after creation by changing properties or by calling methods. Set this property to turn on antialiasing for box axes. The default value is 0. Set this property to draw box-style axes for Map graphics. In the image on the left, BOX_AXES is not set; on the right, BOX AXES is set. If the values of the GRID_LATITUDE or GRID_LONGITUDE properties are changed, or if the limits of the map are changed, the box axes are recalculated to fit to the new grid line locations. Once added, box axes can be hidden by setting the MAPGRID object's BOX_AXES property to 0. You can change the properties of box axes using the COLOR, BOX_ANTIALIAS, BOX_COLOR, and BOX_THICK properties. Set this property to a string or RGB vector that specifies the color of the box axes only. When BOX_COLOR is set, the white boxes remain white, but the other boxes change color. The BOX_THICK property controls the thickness of the box axes. You can specify the integer values 1 through 4 (1 = thinnest, 4 = thickest). The default value is 1. Set this property to a string or RGB vector that specifies the color of the grid lines and box axes. If BOX_COLOR has already been set, the COLOR property only affects grid line color. The default value is "black". Set this property to a string or RGB vector that specifies the color of the filled background. Set this property to a scalar -1 to turn off the fill (this is the default). Set this property equal to a string specifying the IDL or system font for the labels. The default value is "DejaVuSans". Set this property equal to an integer specifying the font size for the labels. The default value is 9 points. The longitude grid spacing, in degrees. The latitude grid spacing, in degrees. Set this property to a string or RGB vector that specifies the color of the horizon line. The default value is "black". Note: Setting the HORIZON_COLOR will automatically turn on the horizon line. Set this property to an integer or string specifying the line style for the horizon line. MAPGRID will draw the horizon line around the border of the map. The default is 'none' (no horizon line). If the HORIZON_LINESTYLE is currently set to 'none' (no line), then setting either the HORIZON_COLOR or HORIZON_THICK will automatically change the HORIZON_LINESTYLE to 'solid_line'. The following table lists the index values and strings you can use with this property. You can also set the line style to a two-element vector, [repeat, bitmask], specifying a stippling pattern. The repeat indicates the number of times that individual bits in the bitmask should be repeated. (That is, if three consecutive 0’s appear in the bitmask and the value of repeat is 2, then the line that is drawn will have six consecutive bits turned off.) The value of repeat must be an integer between 1 and 255. The bitmask indicates which pixels are drawn and which are not along the length of the line. The bitmask should be specified as a 16-bit hexadecimal value. For example, [2, 'AAAA'X] describes a dashed line with very short dashes of length 2 bits each. Set this property to a value between 0 and 10 that specifies the thickness of the horizon line. A thickness of 0 displays a thin hairline on the chosen device. The default value is 1. Note: Setting the HORIZON_THICK will automatically turn on the horizon line. Set this property to the left-right alignment of the text labels, where 0.0 is left justified, 1.0 is right justified, and 0.5 is centered. The default value depends upon the LABEL_POSITION and LABEL_ANGLE. Note: Setting either LABEL_POSITION or LABEL_ANGLE will reset the LABEL_ALIGN to its default value. Set this property to the rotation angle of the text labels, in degrees from 0 to 360. Set this property to -1 to automatically compute the angle for each grid line (this is the default behavior). Set this property to a string or RGB vector that specifies the color of the label text. The default is the same as the COLOR. Set this property to 1 to fill the label background. The default is 0, unfilled. Set this property to a string or RGB vector that specifies the color to use if the label background is filled. The default is -1, which makes the label background have the same color as the window background. If all of the grid locations are integers, then the label format is given by ddd°N|S|E|W, where ddd is the absolute value of the latitude or longitude in degrees, and the N|S|E|W gives the cardinal direction. Note: If any of the GRID_LONGITUDE, GRID_LATITUDE, LONGITUDE_MIN/MAX, or LATITUDE_MIN/MAX properties are changed, then the function will be called again to compute the new labels. Set this property to a number between 0 and 1 giving the normalized label position along the grid line. The default is 0.5, which centers the labels. Set this property to 1 to insert labels (the default behavior), or to 0 to hide the labels. Set this property to the vertical alignment of the text labels, where 0.0 is bottom justified, 1.0 is top justified, and 0.5 is centered. The default value depends upon the LABEL_POSITION and LABEL_ANGLE. Note: Setting either LABEL_POSITION or LABEL_ANGLE will reset the LABEL_VALIGN to its default value. The maximum grid latitude, in degrees. Minimum latitude, in degrees, to include in the grid. Maximum longitude, in degrees, to include in the grid. Minimum longitude, in degrees, to include in the grid. This property retrieves an array of MAPGRIDLINE objects, representing the latitude lines. See the LONGITUDES property below for a list of the available properties. Set this property to an integer or string specifying the grid line style. Set to 1 to enable anti-aliasing for the line. COLOR A string or RGB vector containing the line color. FONT_NAME The font name for the label. FONT_SIZE The font size (in points) for the label. FONT_STYLE An integer or string giving the font style for the label. A number giving the left-right alignment of the label. LABEL_ANGLE The rotation angle of the text labels, in degrees. LABEL_COLOR A string or RGB vector giving the label color. LABEL_FILL_BACKGROUND Set to 1 to fill the label background. LABEL_FILL_COLOR A string or RGB vector giving the label background color. LABEL_FORMAT A string giving the name of a callback function. LABEL_POSITION A number from 0-1 giving the label position along the line. LABEL_SHOW Set to 1 to show the label, 0 to hide. LABEL_VALIGN A number giving the vertical alignment of the label. An integer or string giving the line style. The location (in degrees) of the grid line. The percent transparency of the line. The default is 50. ZVALUE The Z coordinate for the line. Note: Changing one of these properties will only affect that particular MAPGRIDLINE object. However, if that same property is later changed on the parent MAPGRID object, it will overide the individual property values on the MAPGRIDLINE children. Note: If you set any of the GRID_LONGITUDE, GRID_LATITUDE, LATITUDE_MIN/MAX, or LONGITUDE_MIN/MAX properties, then the MAPGRIDLINE objects may be automatically destroyed. In this case, you should retrieve the LONGITUDES or LATITUDES again to ensure that you have valid objects. Set this property to a value between 0 and 10 that specifies the thickness of the grid lines. A thickness of 0 displays a thin hairline on the chosen device. The default value is 1. An integer between 0 and 100 that specifies the percent transparency of the grid. The default value is 0. Set this property to a scalar value to be used as the z-coordinate for the grid lines. By default, 0.0 is used as the z-coordinate. Added HORIZON_COLOR, HORIZON_LINESTYLE, and HORIZON_THICK properties. Added the ability to use a stippling pattern for HORIZON_LINESTYLE and LINESTYLE. 8.6 Changed default font name.